Those who have followed Green Isac from ther very beginnings – the Strings & Pottery album from 1991 – have witnessed plenty of growth and evolution over the last 25 years, beginning as the duo of Morten Lund (guitars, bass, keyboards, flute, etc.) and Andreas Eriksen (world percussion, keyboards, electronics) with a simple concept of creating an ethnic stew fusing rhythms and electronics, later adding more ideas and instruments to that concept, along with additional guest players as needed to realize the development in progress over the course of five studio albums. Last year the group officially expanded to a five-piece, now including longtime collaborator Tov Ramstad (electric cello), and relative newcomes – since 2014 release Passengers – additional percussionist Frode Larsen and keyboardist Jo Wang, allowing Lund to concentrate on guitars. And with that change, they became Green Isac Orchestra. The three newest members also participate in the group compositions, adding a whole new dimension to the group concept, with new melodic richness and exotic trancelike rhythms. The shaded hues and brilliant colors of their melodies are underpinned by innovative rhythmic play borne of world percussion, the standard drum kit, and electronics, bringing together elements of minimalism, jazz, and global fusion. Having a second percussionist in the group further underscores their vision and brings new dynamics and expressive power to the group’s otherworldly instrumental sound. There’s plenty here in these seven tracks to satisfy the tastes of the discriminating and adventurous listener. A listener enamoured of Spotted Peccary's recent output might understandably come to Green Isac Orchestra's self-titled release expecting another helping of the refined synthesizer-heavy ambient music the label's lately issued. Needless to say, the Norwegian-based group traffics in a dramatically different style, one that blends elements of post-rock, electronica, ambient, and World music into a highly distinctive and personalized electro-acoustic fusion. 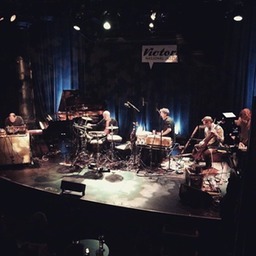 The project isn't an entirely new venture: multi-instrumentalist Morten Lund and percussionist Andreas Eriksen have operated under the Green Isac name since 1991, but for this latest collection on the Spotted Peccary label they've added Frode Larsen (percussion), Tov Ramstad (electric cello, saw), and Jo Wang (piano, mellotron, therevox, synths) and re-christened it the Green Isac Orchestra. To bolster the band feel, the album's seven tracks were recorded live in the studio, a move that sees an effective balance achieved between polish and spontaneity. A smart move it was, too, as the music exudes a vitality that can sometimes be lacking when material's methodically assembled layer by layer. That the album's self-titled also feels right, intimating as it does a slate wiped clean and a new beginning. The quintet casts a wide stylistic net and does so abetted by a globe-spanning mini-orchestra of instruments that includes piano, mellotron, synthesizers, electronic drums, cello, kalimba, and percussion. All such sounds are used organically in the service of the material and help bring the group's Fourth World fusion into focus. In fact, there are times when an arrangement is so rich in instrument sounds, it's hard to believe that the material was executed live. At such moments, it becomes especially evident that great care must have been given to working out the arrangements beforehand so that they could be executed flawlessly. To their credit, Lund and Eriksen don't treat the added musicians as hired hands but as equal contributors to the total sound. As if to drive the point home, Ramstad's cello is prominently featured in the marvelous opener “Emmesity,” a punchy and melodically strong 5/4 workout that swings with determination. It's hardly the singular dominant sound, however, as percussion, piano, saw, and guitar are also focal points within the arrangement. Abetted by the presence of Elvind Aarest on guitar, the slow-motion “Thón” exudes dream-like qualities of mystery and intrigue that act on the listener like a narcotic; the closing “57 Varieties,” by comparison, deftly threads minimalism-styled patterns into an alternately kinetic and rollicking 7/4 pulse like it's the most natural thing in the world. Lund, Eriksen, and company are to be commended for confidently weaving a huge number of disparate acoustic and electronic sounds into a given production with little apparent concern for how it might end up stylistically branded. What comes out the other end sounds like nothing more or less than the Green Isac Orchestra, which I'm guessing would be exactly to their liking. Gentle and relaxing, rich and heady; Green Isac Orchestra soothes and stimulates the senses with a deft blend of electronic individuality and acoustic passion. 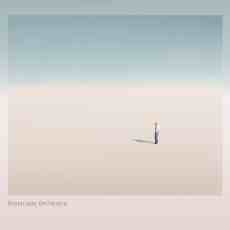 The ensemble manages to produce music of great serenity and melodic warmth without ever falling into new-age cheesiness. The themes are gracefully understated; the beats languid, tribal; the colours deep and saturated. There are elements here to please fans of entho-ambient music whilst at the same time perhaps appealing to downtempo lovers that enjoy global sounds. The list of sound sources is broad: with electric cello, Variax guitar, shahi baaja, kalimba and Chinese hammered dulcimer interwoven with piano, mellotron, synthesisers and samplers. Beats bring together electronic drums, djembe, tumbadora, shekere and ghatam. This sprawling diversity of sound, however, is masterfully combined and performed with such elegance that there is a great sense of authenticity about Green Isac Orchestra. This is not cut-and-paste sampler music. Green Isac Orchestra is delivered in a pale gatefold card wallet with something of a minimal approach: colours are simple, pastel hues of limited palette; fonts are unfussy and fine; information restricted to the necessary details of personnel, recording credits and Internet addresses. The frontal image has a lone figure on an endless plane gazing ahead into eternity - only a shadow for company. Track titles appear with running times on the rear cover. 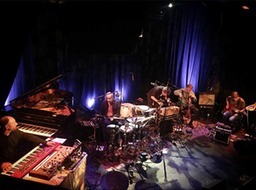 Green Isac have been producing music for around a quarter of a century now; Morten Lund and Andreas Eriksen working as a duo focussing on instrumentation and percussion respectively. Green Isac Orchestra sees the addition of three more players: Frode Larsen on percussion and bells; Tov Ramstad on cello, ukulele, saw and bass and Jo Wang on keyboards. The resultant recordings are engrossing, meditative affairs that do so much more than throw ethnic sounds into the mix as flavours or just for effect. The combination feels very 'right' as if transcending ethnic origins; very 'natural' since expression and performance are clearly central features. Do explore this quality release via the ensemble's own website or by means of the Spotted Peccary label page where you can find listening opportunities, videos, purchasing options and a wealth of information.